The committee commissioned local artist Douglas Lochner to come up with a design and engineering specifications for the Wings of Honor tribute to honor all who served and commemorate the historical significance of the Marine Corps Air Station at the Santa Barbara Airport. This is his seventh public art commission. “My quest was focused on conveying the spirit of servicemen and women. To me, it is not about bullets, bombs and bayonets, but rather about honor, loyalty, service and sacrifice,” said Lochner. The design shows two massive cantilevered glass wings each weighing over five tons. Each free-standing wing consists of six separate glass feathers, layered and laminated to form a wing. The longest feather is twenty feet. The glass wings angle over the walkway creating an arch through which people can walk and behold. It is the largest and most ambitious work Lochner has done to date. “The sculpture is a celebration of those that fight for our freedom. It is uplifting and emotionally soaring, a physical reminder of the significant sacrifice made by these brave men and women,” Lochner said. Careful consideration of aircraft safety and walkway aesthetics went into the design of the illumination of Wings of Honor. 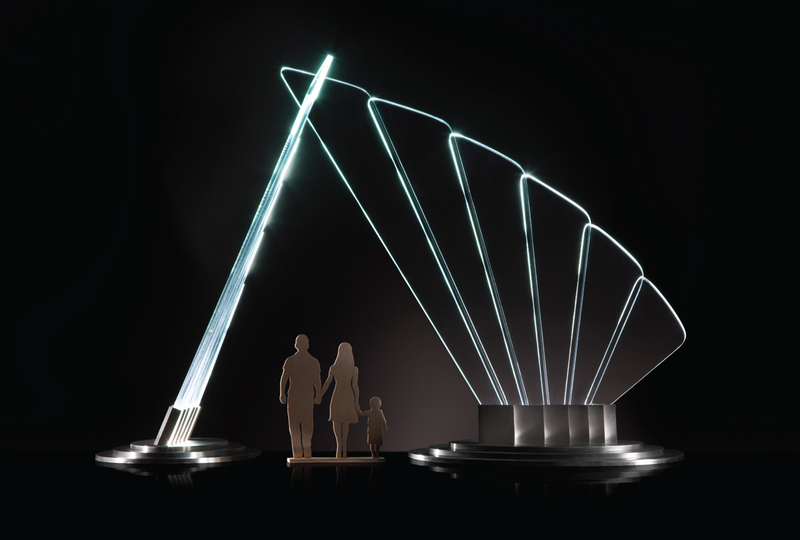 The glass of the sculpture will be edge-lighted by robust LED modules inside the base to illuminate the night-time sculpture with no evident source of light. The lighting design eliminates glare while enhancing the ethereal quality of the artwork. Moreover, the walkways, landscaping, descriptive visuals, electronic content and restful benches combine with the sculpture to create an environment steeped in symbolism while adding knowledge of local history thereby enriching the airport visitor experience. One of Santa Barbara's foremost landscape architects has been retained to incorporate native plants and ensure the site complements the existing airport landscaping. To learn more about Douglas Lochner, read his feature in Ventana Magazine. To learn more about Wings of Honor and how to support the project, visit http://www.wingsofhonorsantabarbara.org.